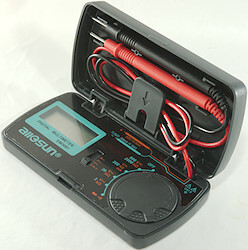 This is a pocket meter in its own box. 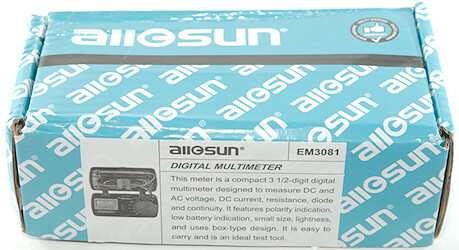 The meter arrived in a All-Sun cardboard box with sticker saying what meter was in the box. 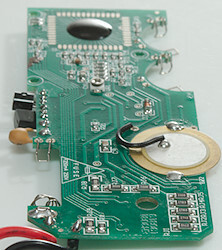 The probes are small and unmarked. and are fairly easy to unpack and pack, but the lock on the box is not very good. Both the slide and the rotary switch can be used single handed. 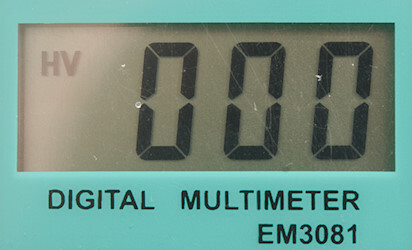 Typical display during usage, it will show the number and in the 600V range a HV will also be shown. : Ohm, continuity and diode. 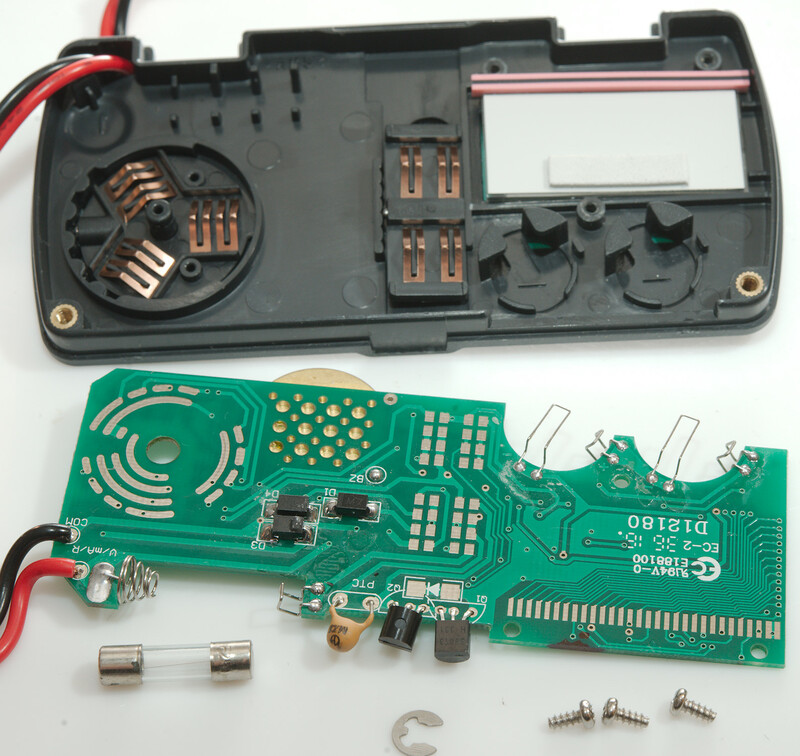 : Continuity and diode (Diode voltage is not correct). 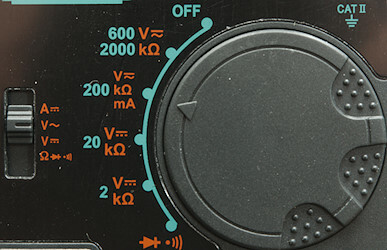 6.5 VAC in 200V range is 5% down at 5kHz (The error due to diode drop is not included). Input impedance is 0.5Mohm on AC for positive cycle and high for negative cycle (Single diode rectification). 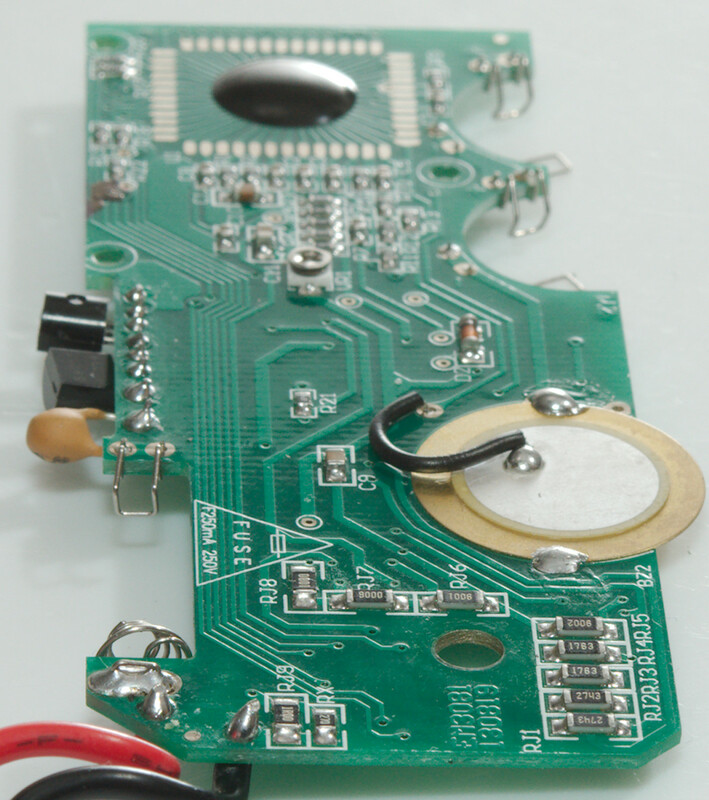 2VAC & 20VAC exist, but is 0.6V low due to a diode drop. 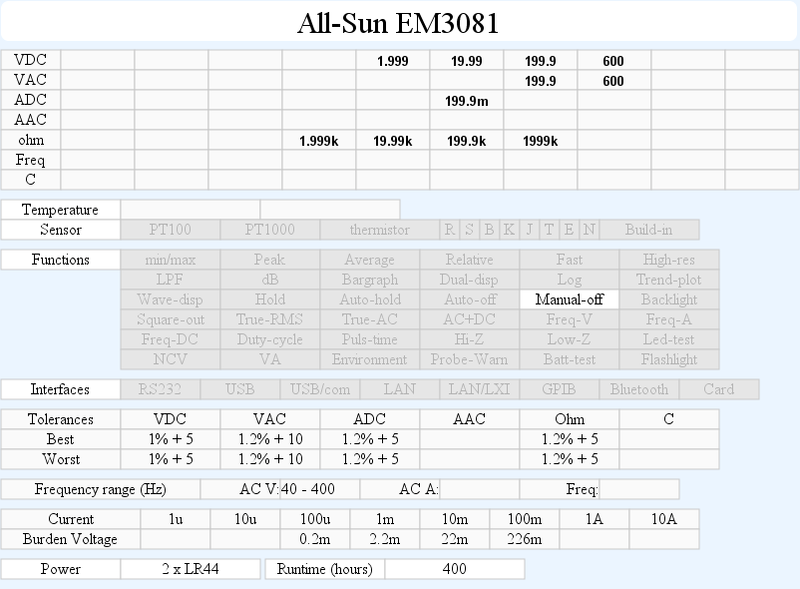 Ohm is 0.44V open and 66uA down to 0.44uA shorted depending on range. Continuity is very slow (About 500ms). 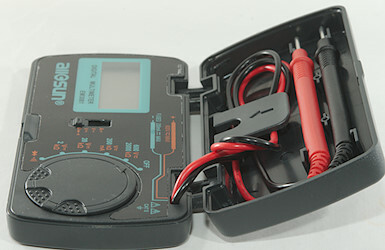 Meter works down to 1.3V where meter shows overrange, battery symbol show at 2.4V. 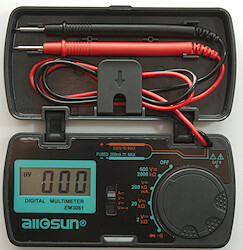 Meter reading is stable down to 2.4V, below 2.4V it will increase and show random values. 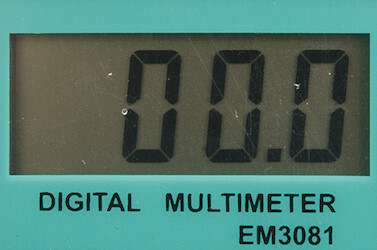 The meter need one or two display update to reach the final value. 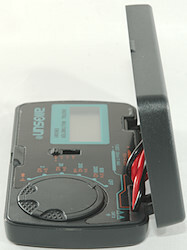 Weight is 92g without accessories, but with batteries. Size is 114 x 57 x 22mm when closed. 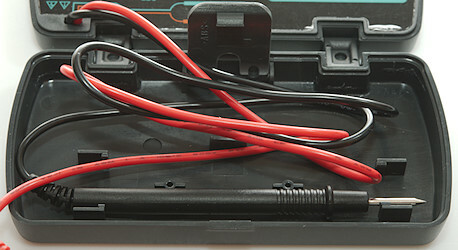 Probe wire is soft, thin and 40cm long. 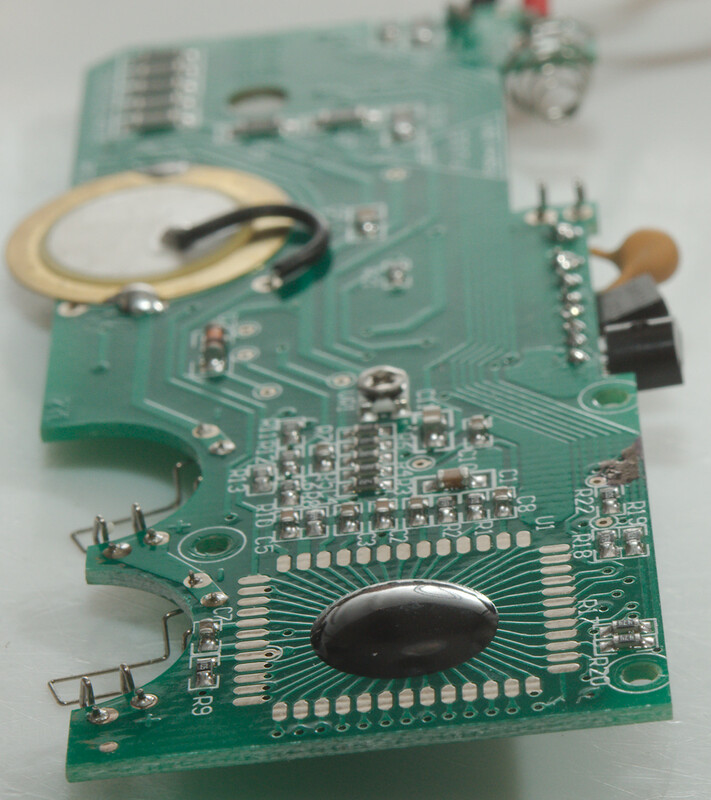 2VAC and 20VAC range exist, but has a 0.6V error due to the diode rectification (That error exist on ALL AC ranges). I had to remove 2 screws to open it. 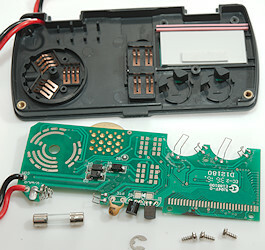 This releases the internal lid for the lower part of the box, where all the multimeter is build. Both battery holder and fuse holder is made with the circuit board and shapes in the lid. 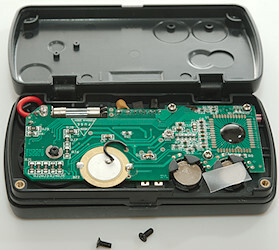 3 more screws and a locking ring more to release the circuit board from the lid. The slider has 4 switches and the range switch 3. 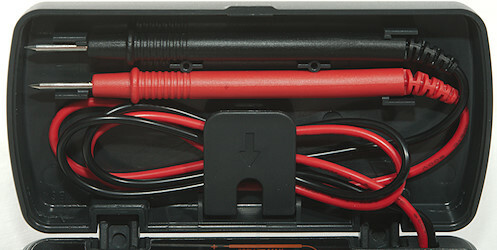 There are shapes in the plastic for the two battery holders and for the fuse. This side of the circuit board has the two switches, connections to the display, wires for the batteries and fuse and the ohm output protection with a PTC and two transistors as a clamp (Q1 & Q2). Two of the diodes (D3 & D4) are probably protection for the current shunt and the last (D1) the AC rectifier diode. The current shunt (RJ9 & Rx) are placed near the input wires, the voltage input is a couple of resistors (RJ1, RJ2, RJ3, RJ4, RJ5). Two of the resistors (RJ1 & RJ2) are bypassed in AC mode. The meter has a trimpot. As usual a invalid CAT rating, a 250V glass fuse in a 600V meter is a no go. I like the box where probes fits nicely into, but the meter has very few ranges and no functions. 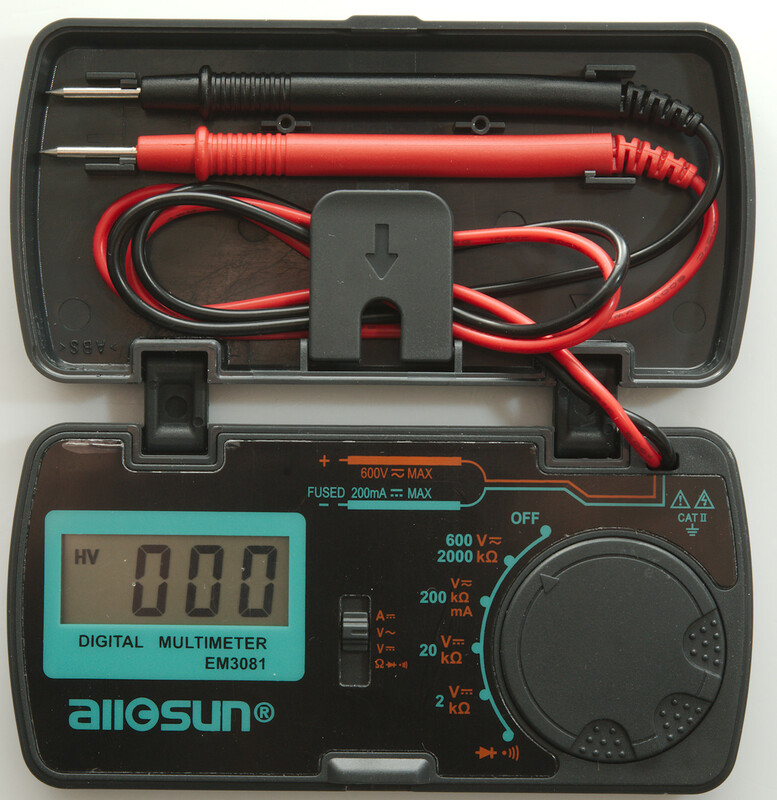 It is also easy to make mistakes with the AC voltage ranges, because the 20V (and 2V) range will show a sensible voltage, just 0.6V too low. As usual the combined diode and continuity shows wrong voltage.